Broome is famous for its beautiful long beach, Cable Beach, which runs for approximately 23 kilometres from Gantheaume Point in the south to Willie Creek in the north. It is possible to walk or cycle this beach, but you need to be aware of the tide times for cycling as there is up to 10 metres of movement and the sand can become too soft to cycle on at high tide. The variety of shorebirds varies throughout the year, but the Pied Oystercatchers and Red-capped Plovers remain when the other shorebirds migrate to the north and they breed along Cable Beach. 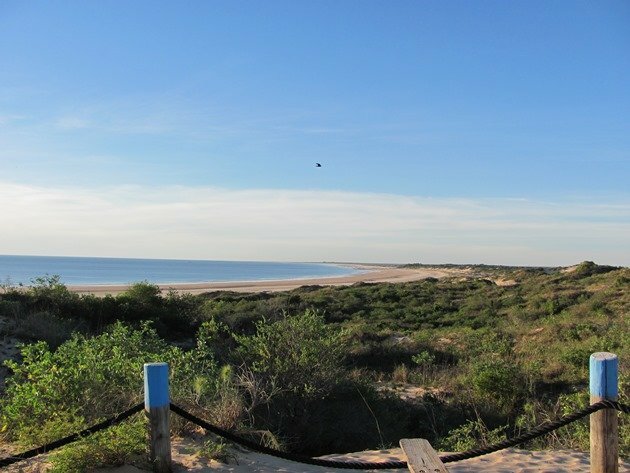 Another option is to walk part of the southern section of Cable Beach through the dune system that runs behind it. 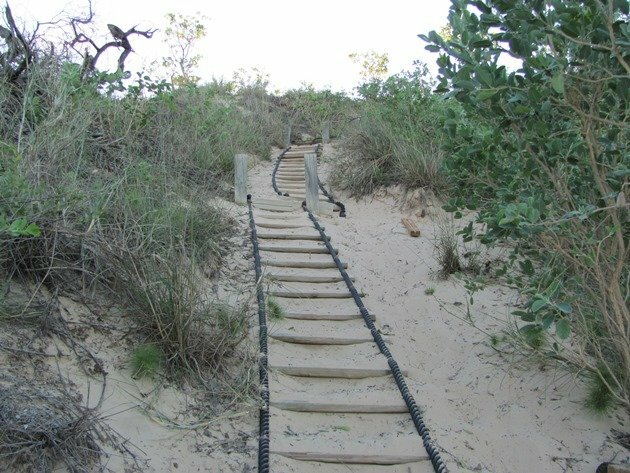 You can start the walk trails in various places and then follow the trails in the vine thicket behind the dunes and cross over onto the beach at various allocated spots. The trails are well-marked with wooden bollards and there are some informative plaques identifying some of the native local trees. The trails run from the car-park at the Surf Life-saving Club, the car-park at De Marchi Road and the car-park at Howe Drive. You can just walk through the thicket and onto the beach or along the trails and then over either further to the north or south. There is also a base camp closer to Gantheaume Point where cultural tours take place during the year. We prefer to walk from the Surf Life-saving club to the south and once we have walked the 4 kilometres towards Gantheaume Point we walk up and over onto the beach and then back along the beach for variety. Last week we did this trail to see what birdlife was currently using the vine thicket, because it varies throughout the year. The Singing Honeyeater was by far the most common honeyeater and this has dominated over the usually more common Brown Honeyeater around Broome in recent weeks. 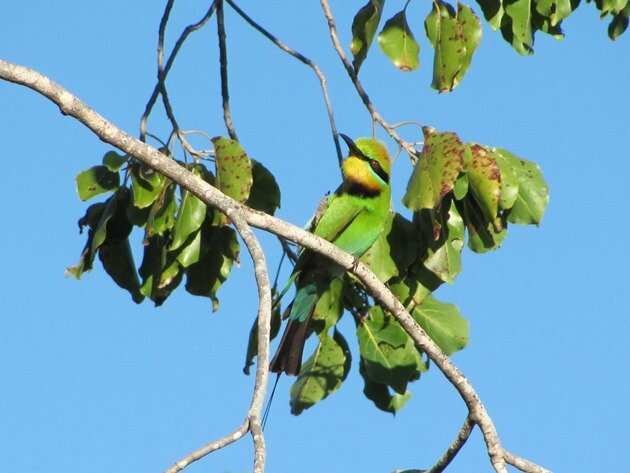 There were several Rainbow Bee-eaters chasing insects amongst the trees stopping briefly between their rapid circular flights. They even stopped to have a scratch which I was able to capture with my camera. 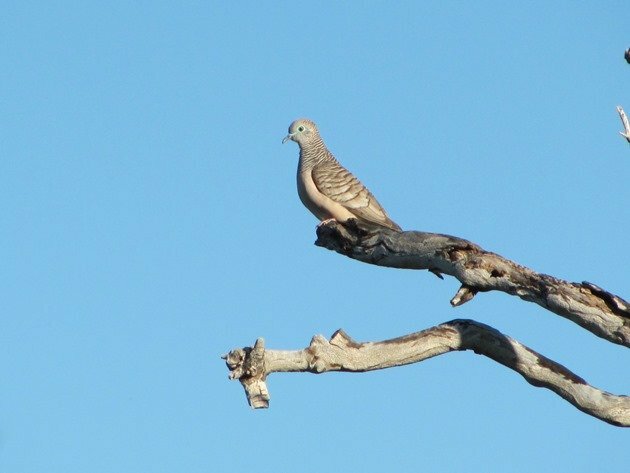 There were numerous doves and the Peaceful Dove was more easily observed than the Bar-shouldered Dove, both of which are common in our garden as they visit for water on a regular basis. Close to the De Marchi entrance to the park we have known of a bower that has been established for many years. It has been rebuilt several times and there appears to be two currently in use. 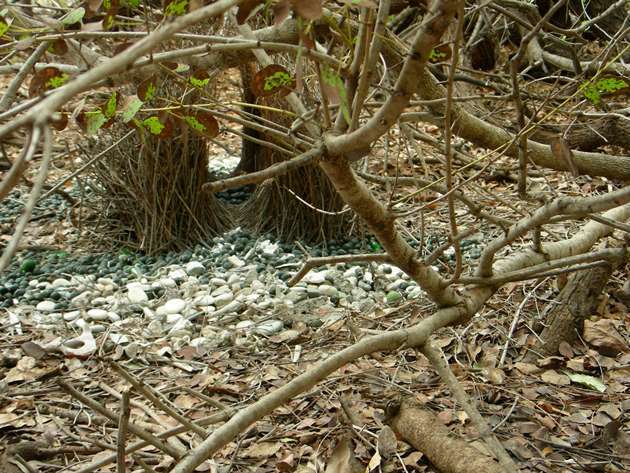 The male Great Bowerbirds build these bowers to attract females and fill them with a variety of items to attract them. They prefer green, white and shiny items and the current bowers have been built under the lower branches making it rather hard to photograph them. They have built the bower directly under a Nickernut tree, so they have ample supply of green seeds and once they change colour they are removed from display. They also collect white shells, pieces of bone, screws and anything else that takes their fancy and isn’t bolted down! Grey-crowned Babblers chuckled amongst themselves as we walked along the trail and Torresian Crows explored the recently burnt bush. A Brown Falcon swooped through looking for prey and Brahminy Kites, Black Kites and Whistling Kites soared overhead. We discovered a deceased Wedge-tailed Shearwater, which was no doubt a victim of Cyclone Rusty earlier in the year. 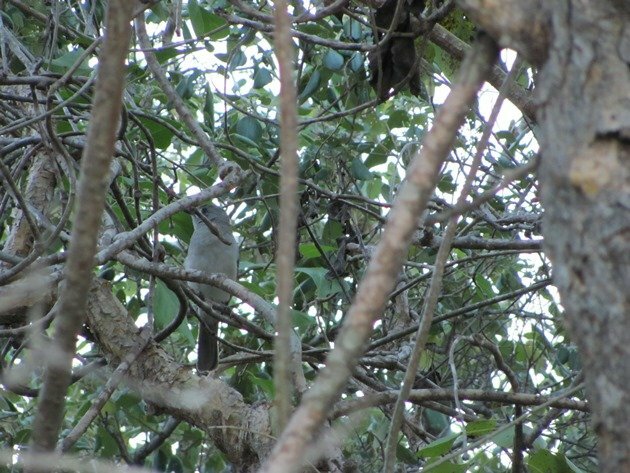 As we approached the wooden walkway to take us over onto the beach we were whistled at by a Grey Shrike-thrush that was hiding in dense foliage. As we climbed up over the dunes on the trail we were surrounded by Tree Martins as we took in the view of Cable Beach looking north. It was impossible to take a photograph and not include one! 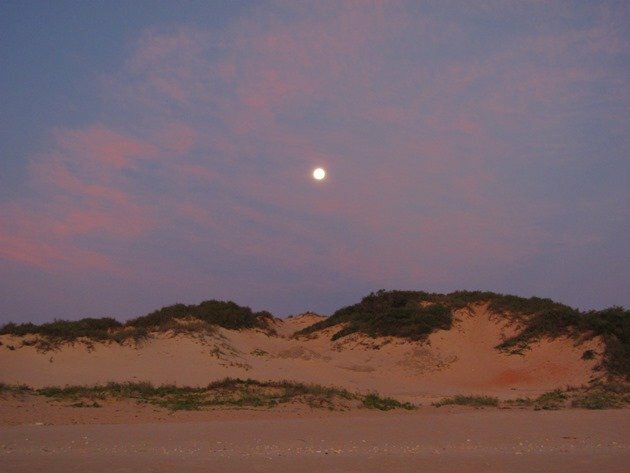 We then walked the 4 kilometres back to the Surf Life-saving Club back along the beach taking in the moon rise and the sunset. 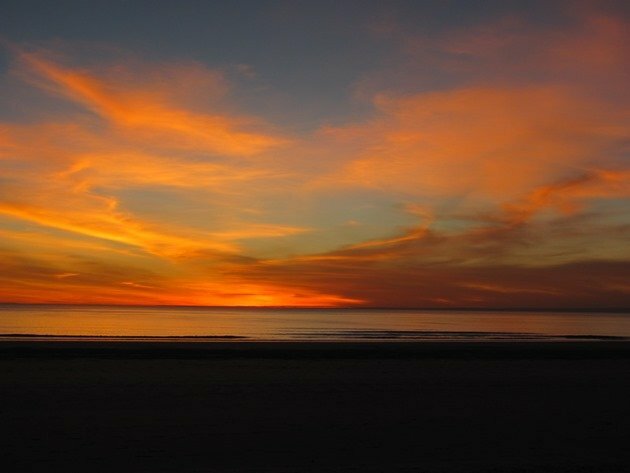 The sunsets in Broome are especially good when there are clouds about and we experience them around 5:30pm in winter and 6:30pm in summer. This walk took approximately two and a half hours and offers a great variety of birds at any time of year. That looks like a truly magical walk with an incredible variety of beautiful birds and views! 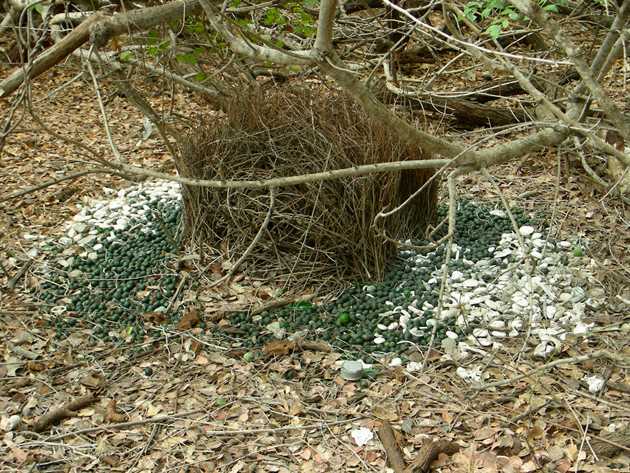 The Bowerbird bower is fascinating! It really is great to have the option of a beach walk incorporating a walk in a vine thicket right here along our coastline. Bowers are fascinating! 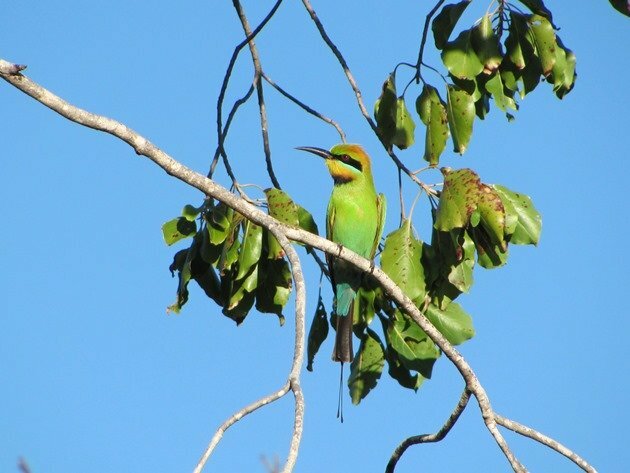 Clare, this post has so many things that I love from bowers to bee eaters to beaches! Thanks for sharing these wonders that are so common for you. Thanks Mike….it is easy to overlook the common things in our lives and forget they are not common to everyone! Great town Broome! Lived there for 3 months in 2005, really enjoyed my time there! I guess you need to return!